The Socio-Economic Rights and Accountability Project (SERAP) has sent a Freedom of Information request to Brigadier-General Sule Kazaure, Director-General of the NYSC, asking him to “use his good offices and leadership position to urgently provide information on specific details and documents on the Exemption Certificate granted to the Minister of Finance, Mrs. Kemi Adeosun”. "provide information and documents on whether Mrs Adeosun applied for NYSC Exemption Certificate, and if she did, to clarify whether the NYSC actually granted her the Exemption Certificate, the circumstances and the provisions of the NYSC Act under which the Exemption Certificate was granted”. The organization said it “needs the information to determine if the crime of forgery has been committed, and if so, to consider possible action in the circumstances, including but not limited to asking the Attorney General of the Federation and Minister of Justice, Mr Abubakar Malami (SAN), to pursue prosecution or in the absence of that, for us to consider the option of a private prosecution”. According to the organization, Adeosun remains innocent until the allegations against her are properly tested and proven beyond a reasonable doubt in a court of competent jurisdiction based on relevant admissible evidence, but the continuing silence by the NYSC management on the matter may create an impression that an offence may have been committed, and lead to accusation that the management has something to hide. “We urge you and the entire NYSC management and leadership to open up on the matter and provide information and documents as requested. This will be one step in the right direction. If the information is not provided to us within 7 days of the receipt and/or publication of this letter, the Registered Trustees of SERAP shall take all appropriate legal actions under the Freedom of Information Act to compel you to comply with our request,” the letter reads. “SERAP notes that following allegations of NYSC Exemption Certificate forgery against Mrs Adeosun, the NYSC management issued a statement confirming that she did apply for an Exemption Certificate and promising to ‘investigate the origin of the purported Exemption Certificate in question’. “However, we are concerned that the statement lacks specificity as to whether Mrs Adeosun was issued the Exemption Certificate. Further, although the statement was issued on 9 July 2018, the NYSC management has so far failed and/or neglected to publish the outcome of the investigation it promised. 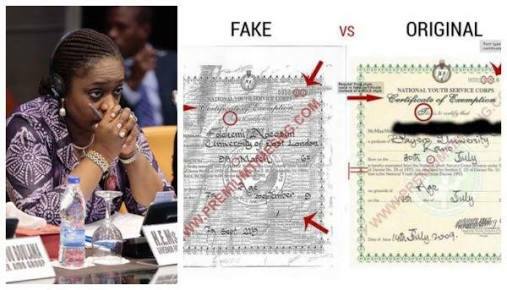 Nigerians are also entitled to the right to truth derived from the obligations of the government and its institutions to carry out an investigation into allegations of issues like forgery that have been levelled against Mrs Adeosun. “By Section 1 (1) of the Freedom of Information (FOI) Act 2011, SERAP is entitled as of right to request for or gain access to information, including information on the circumstances and the provisions of the NYSC Act under which any NYSC Exemption Certificate was granted to Mrs Adeosun. “By Sections 2(3)(d)(V) & (4) of the FOI Act, there is a binding legal duty to ensure that documents containing information relating to the granting of any NYSC Exemption Certificate are widely disseminated and made readily available to members of the public through various means.